1) I was given a lot of flower seeds in packs that I will not be able to plant this year. How can I save them for another year? What do you suggest? I have heard that I could refrigerate or freeze them. If yes, please give details: temperature, how long, etc? 2) I also have a lot of zinnia and marigold seeds from my garden last year. They are very dry but am now keeping them in a hot garage. How do I store them? The article did not have much about refrigerating or freezing seeds or about flower seeds. Do you have an article on that? Vegetable and flower seeds may be kept for one year without appreciable decrease in germination. Storage may be extended to 10 or more years under proper conditions. Seed moisture and storage temperature are the most important factors in determining how long seed can be stored. The drier the seeds are, the longer they will store. A garden’s success depends in part on the quality of seeds planted. Ensure good quality seed by planting fresh seed from a reputable seed company. Often, there is seed left over after a crop is planted. If there is enough for the next year, save it. In Colorado, all vegetable and flower seeds will store on a shelf at room temperature for at least one year without significant loss of germination. 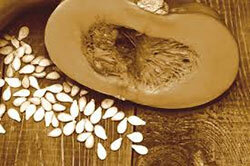 If there is enough seed for several years, then take further steps to ensure viability. A 10-year storage life can be achieved by drying seed to less than 8 percent moisture. To do so, dry seed at 100 degrees F for six hours. Obtain this temperature by spreading the seed out in direct sunlight. However, because sunlight is harsh and easily can exceed this temperature, drying in the shade is better. Never use a microwave oven. You may use a conventional oven if you keep the door open and the seed is not heated to more than 100 degrees. Package the seed in moisture-proof containers and store it in a refrigerator or deep freezer. A moisture-proof container is one that stores seed safely while submerged in water. Use sealed cans or jars, rather than plastic bags. Conditions essential to good seed storage are just the opposite of those required for good germination. Good germination occurs when water and oxygen are present at a favorable temperature. Good seed storage results when seeds are kept dry (below 8 percent moisture) and the temperature is kept low (below 40 degrees). When seed moisture and storage temperature are low, the presence of oxygen has not been shown to be a factor in seed longevity. Germination is unaffected by storage in atmospheres of nitrogen, carbon dioxide, partial vacuum or air. Relative humidity (RH) influences the moisture content of seed if it is not stored in moisture-proof containers. For example, at 15 percent RH, seed will dry down to 6 percent moisture and will store safely in this condition for several years. However, at 90 percent RH, seed will dry down to only 19 percent moisture and germination will be poor after one year. The drier the seeds, the longer they will store. There is a chance of producing what is known as “hard seed” if moisture is reduced below 8 percent. Hard seed resists germination under favorable conditions because it does not absorb enough water. When planted, the seed gradually absorbs water, germinates and produces seedlings over an extended period. A seed lot containing 50 percent hard seed is little better than a lot containing 50 percent dead seed, because neither produces a stand of seedlings when they should. Beans and peas are particularly subject to this condition and therefore should not be dried as completely as other seed. If they have been overdried, they germinate better if exposed to a humid atmosphere for two weeks before planting. Wash the seed free of plant matter, dry them for six hours outside in the shade. Preferably somewhere the birds do not eat them. In humid coastal Georgia, after drying in the shade give them a couple hours in low-humidity air conditioning for a couple hours before packaging them in airtight bottles. Put them in either your refrigerator (it is below 40F) or freezer. As long as the water is out of the seed, no water crystals will form inside the seed coat to slice up the seed embryo and cotyledons. The same steps for all common flower and vege seeds. This does not have to be complicated. They are all dicotyledonous annuals and all herbaceous. Changing a tire on a Toyota is basically the same as changing a tire on a Ford. If you want complicated, look at storing woody cuttings.